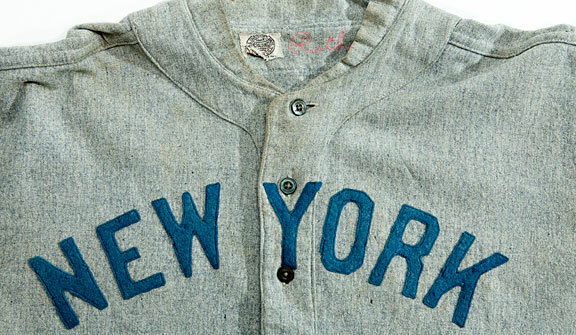 On this day in 2012 Babe Ruth's 1920 jersey sells at auction for $4,415,658. This was the largest amount ever paid for a piece of sports memorabilia according to auctionreport.com. The woolen uniform was worn by Ruth during his first season as a Yankee after being traded to New York by the Red Sox. Also on this day in 1976 the Yankees and the Red Sox are in one of the ugliest brawls in the history of the rivalry when Carlton Fisk stabs Lou Piniella with the ball when Sweet Lou tried to score. Bill Lee suffered a separated shoulder in the fight with Graig Nettles and caused him to miss most of the season. Also on this day in 1959 the Yankees enter last place in the American League for the first time since 19 years when they lost to the Detroit Tigers 13-6. Also on this day in 1948 Joe DiMaggio had four extra base hits for the fourth time in his career in Chicago in front of 5,001 fans. DiMaggio hit for the cycle for the second time in a 13-2 victory over the White Sox. The Yankees had 22 hits and DiMaggio had two home runs, a triple, a double, a single, and six RBI's. Also on this day in 1945 Pete Gray led the St. Louis Browns to a doubleheader sweep of the New York Yankees after scoring the winning run in the second game. Gray collected three hits in the first game and the one-armed outfielder makes ten putouts in the field in the second game. Also on this day in 1918 Tris Speaker was struck in the head with a pitch off of Red Sox submariner Carl Mays. Mays would also hit Ray Chapman two years later in the head with a pitch that would kill him as a member of the New York Yankees. Speaker thought that Mays hit him on purpose in the head but Mays always denied the allegations. Finally a mere seven years later in 1925 Speaker scored from first base on a single scoring the winning run in a 10-9 walk off win over the Yankees. The Indians scored six times in the bottom of the ninth to cap off the comeback. Where was Mariano Rivera when you need him?